We often see people stopping in front of the yellow and blue tile on the wall at the front of Belvue in Chare Ends. Some who know what it is get very excited and then they frown: what is the iconic yellow-on-blue scallop Camino shell doing on Holy Island? Is it somehow connected to the ancient pilgrimage route to Santiago de Compostela in Spain (the “Camino de Santiago”)? The story behind it is that over the last two years I walked a total of more than 700 miles along two of the ancient routes that lead to Santiago de Compostela. Mine was not a religious journey (I walked it as a challenge, for thinking space, to explore the countryside and the meet some of the many amazing people you can get to know on such a great adventure), but many take the same route for spiritual or religious reasons. Santiago is the alleged burial place of St. James, patron saint of Spain and one of Jesus’s apostles. 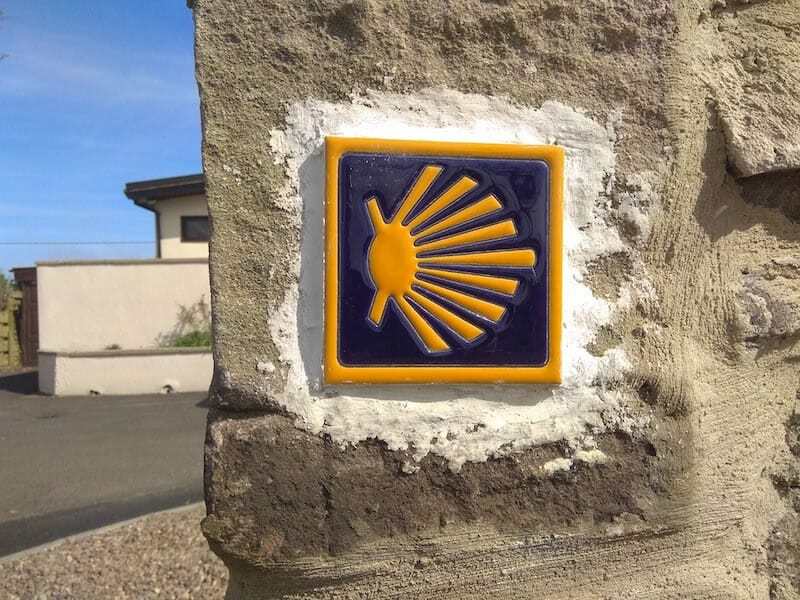 This iconic shell symbol represents the different routes of the Camino de Santiago coming together in one place, the city of Santiago de Compostela. It is also used as a waymarker along the routes to show walkers and pilgrims that they are on the right path (the shell serving as an arrow), helping everyone who walks the route stay on the right path. When we bought Belvue and started the renovation project to turn it into a guesthouse, I thought it would be nice to link my own journey to that of the many pilgrims who walk across the sands to Holy Island, either during Eastertide or as part of St. Cuthbert’s or St. Oswald’s Way. Positioned as it is, it points the way to Lindisfarne Priory. We hope that the shell will bring back good memories of people’s experiences on the Camino, as well as inspire others to get out on local routes. I myself walked the Camino de Frances (a month-long, 500 mile route from the French Pyrenees to Santiago) and the Camino de Portugues (a two week, 200 mile route From Porto, Portugal to Santiago). If you took a selfie or picture with our Camino shell, we’d love you to send it to us on camino@holy-island.uk so we can share it on this site. St Cuthberts Way http://www.stcuthbertsway.info/ (a 62 mile walk from Melrose in the Scottish Borders that can be walked in 3 to 4 days and follows the route St. Cuthbert took from Melrose Priory to Lindisfarne/Holy Island. St. Oswalds Way http://www.stoswaldsway.com/ – (a 97 mile route linking places associated with St. Oswald, King of Northumbria, and linking Lindisfarne to Hadrian’s Wall – 6 to 7 day walk).